• Although you’re all welcome to come crocus-spotting at my house, here at the Gardens, you’ll see plenty of signs of life this week. 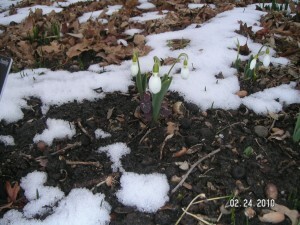 Find snowdrops in the Oak Grove and at the very western end of the Gardens, along the Cheesman fence. 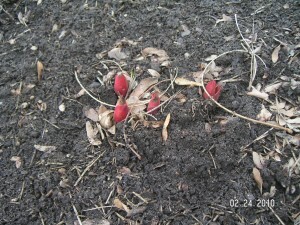 • See bright red peony shoots poking up in June’s Plantasia. • Tulip leaves, especially the smaller species tulips, can be seen all over the place. 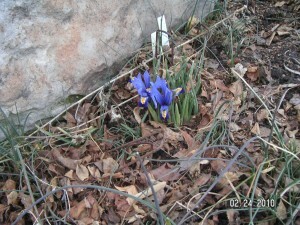 • Tiny blue Iris reticulata are making an appearance in the Rock Alpine Garden. 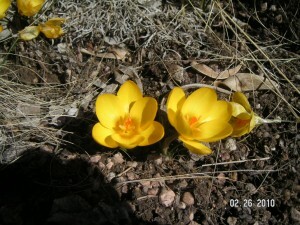 • And we have our own yellow crocuses (croci?) a-blooming here and there, most notably in the Water Smart Garden. 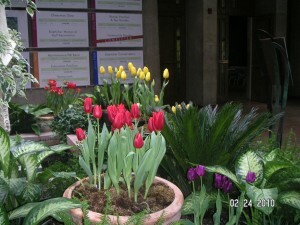 • Of course, if you can’t wait for those tulips to bloom, don’t miss the lobby display, with its hopeful and colorful glimpse of Spring.